Is there anything sadder than an empty treat bag? 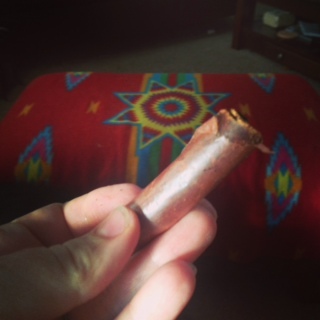 These Jones Natural Chews were torn into by a wild Affenpinscher. Hunny put the bag on my dresser after the fact. Evidently Chewy has zero self control when it comes to Jones Natural Chews. The bag of Pig Ears was placed on my dresser, too. The bag of Max’s Medley, which contains 12 ounces of all natural, made in the USA yum for dogs, was nearly empty, which was not the case when I left home. For some reason I thought that leaving a sealed bag (it zippers closed like a sandwich baggy) wouldn’t be an issue. The top is sealed. Still. The back is torn viciously open. Nope. Chewy had to have all that meaty goodness while I was gone. So this morning I grabbed the bag to see what was left and found what amounted to crumbs. A piece of a Windee, three or four broken Chickly Links and Woofer bits and crumbs. That was IT. I doled out what was left to my greedy, Jones-driven puppies. This poor little Chickly Link was lying sadly in the bottom of the near-empty bag, waiting to join its friends in Chewy’s tummy. Good heavens. You’d think that I haven’t fed them in a week. 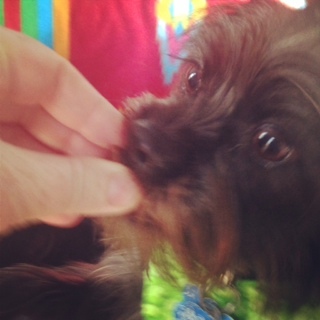 And Chewy is the worst, jumping up to grab the treats out of Flash and Patches’ mouths. He’s aggressive when it comes to Jones chews. And I don’t think he has a favorite yet. He can’t get his tiny mouth around the Windees in the Max’s Medley bag (he hasn’t tried Windees Rings yet), so those go to the big senior dogs who need them, thankfully. The Windees are a natural source of glucosamine and chondroitin. But he sure can nom everything else in the bag, which he’s proven. Flash is taking the lone Windee piece. It’s good for him. What have I learned? 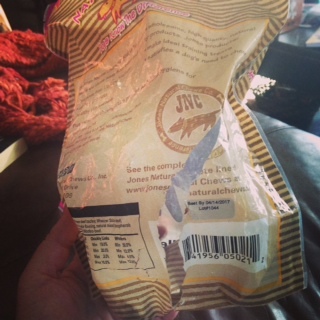 Never leave a bag of treats where Chewy can reach them, sealed or not. I’ve actually been decent about this, but in the rush of packing, I left the Max’s Medley bag out. Stink. 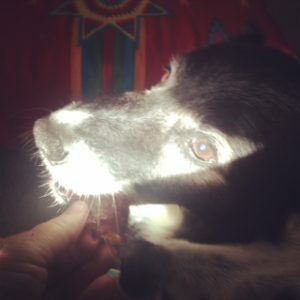 Patches loves the Chickly Links from Jones. Major noms. 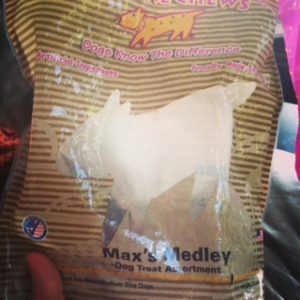 And, to recap, what’s in the Max’s Medley treat bag? Perfect for dogs both large and small. Chewy can attest to that. 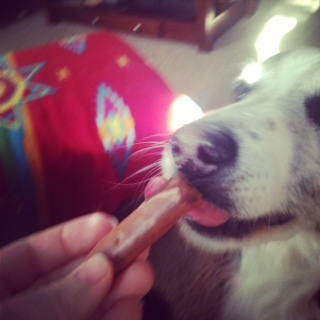 The Woofer bits might be Chewy’s favorite. They’re just ground beef – 100% beef – pressed into a patty and baked. They snap into smaller pieces for a smaller dog. And they’re delicious!